I am talking a lot about power tools in a virtual sense, but actually i just love real power tools. 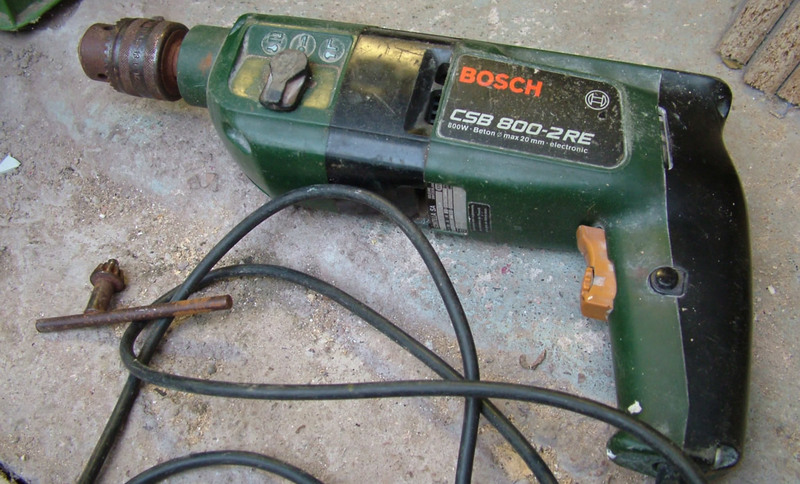 below is an image of my trusted friend: a BOSCH CSB 800 2RE percussion drill, made in germany, 800 watt power, with three mechanical gears and electronic speed control. i have this tool for over twenty years now, and it has helped me a lot with my diy and handyman projects – from mixing mortar, fixing plaster board to metal frames, building garden decking (driving 15cm long coach screws with its fantastic torque), hanging curtain rails, shelf brackets, drilling holes for wall plugs (from miniscule 4mm diameter precison to massive 12mm dia wall plugs for wash hand basins), to polishing silver jewellery (my hobby). the machine is nicely balanced, like an extension of my right hand, strong but not overly heavy, simply fun to work with.